ELEVATION: 1884 Ft. / 1826 Ft.
From Rt. 25 turn on Ryefield Rd. 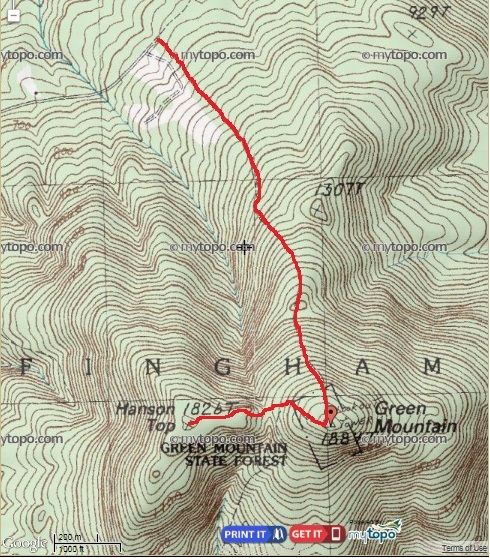 Take a left onto Green Mountain Rd. In 1.0 miles bear right. Look for the small "Green Mountain Fire Tower" wooden sign mounted to the telephone pole. Follow the road 1.3 miles. Parking for 4-6 cars (strategically parked) is available at the end of the road. From Parking there is a Society for the Protection of NH Forests sign marking High Watch Preserve. Take the mustard blazed High Watch Trail. The trail starts gradually the first 0.4 miles then elevation increases making the last 0.75 miles moderately steep and challenging. You will soon reach the summit ridge and the fire tower will appear in front of you. There are 2 benchmark disks (and a large tower) marking the summit. 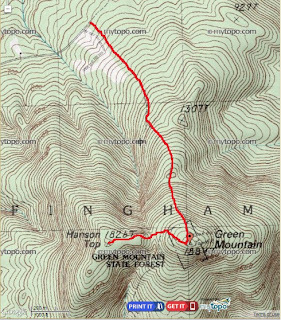 The Hanson Top Trail is 800 Ft away and you'll need to descend the Libby Road Trail following the white blazes a few hundred feet to the summit buildings at N43 46.064, W71 02.291. The trail continues to the right of the buildings and the Hanson Top Trail marked in blue migrates to the right. The Hanson Top trail descends into the saddle between the two peaks then gradually ascends to 1826 Ft Hanson Top. There is a summit register mailbox mounted to a tree on the rise just before the actual summit. There were no official markings however the summit was obvious with good views. Even with the overcast conditions, drizzle and water dripping off the leaf cover it was a great hike. The first half of the High Tower Trail is wide enough for a car (although much too steep to drive) and incline is gradual. There aren't a lot of boulders or rock hopping on the trail and this would be a great hike for kids if they can handle the distance and moderately steep incline. At the start of one steep section a drainage log is crossing the trail and the words "You can do it!" are written in black sharpie across the log. (see photo). The trail levels out briefly as you reach a minor ridge then ascends to the fire tower. As the trail flattens near the top the fire tower will appear 50-100 Ft away. Views are limited from the summit and in the rainy and wet conditions I didn't climb the tower steps for a better view. Today's overcast conditions wouldn't have offered much of a view anyway. Summit buildings can be seen a few hundred feet away at N43 46.064, W71 02.291 by following the Libby Road Trail (White). The Libby Road Trail continues into the woods and begins a moderate descent. in 500 to 600 Ft you will reach the Hanson Top Trail to the right. The Hanson Top trail was well marked with blue blazes but with a lot of twists and turns. Keep your eyes peeled. The trail descends to the saddle then begins a short and moderate incline to the Hanson Top Summit and overlook. Return the way you came.